In this course you will learn How to create an Image Slider In JQuery, HTML5 and CSS3. In jQuery you can do many things in very easy way. Anyone can take this course who want to learn image slider. We will start off by creating a beautiful design for our image slider using HTML5 and CSS3 and then we will work on JQuery to make that design work. Every aspect is covered in great details.First, we will download some cool images from internet. Then we will adjust those images in photoshop. Then We will make a cool image slider design using html5 and css3. 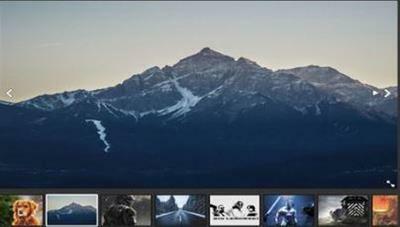 In design, we will show the thumbnails of images on the bottom and slider image on the top. We will learn how to add awesome scroll bar in thumbnails using jquery. Then we will learn how to apply slider on these images and how we can stop and start the slider. Then we will learn how to left and right the image in jquery and how we can choose the image directly from thumbnails. We will also learn how to show the slider on large screen and how to left and right the image on large screen. Then how to close the large screen. we will code full image slider in this course along with explaination. Instructor will explain each and everything in this course. If you face any problem during learning this course you can ask the question at any time and i will answer that question ASAP. I will also help you in coding your image slider if you will get any problem. If you will feel that this course doesn't worth your money. you can refund your money within 30 days after taking this course. So, stop thinking and start learning. I will see you inside.